Navy Vice Adm Tim Giardina was removed from duty in early September. 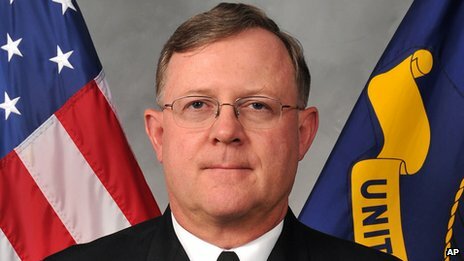 The second-in-command of the US military’s nuclear combat forces has been suspended during an investigation into illegal gambling. Navy Vice Adm Timothy Giardina was removed from duty on 3 September, a US official said on Saturday. Admiral Giardina was serving as the deputy in charge of the US Strategic Command, which oversees nuclear assets. He has not been arrested or charged as part of the inquiry, into possible use of counterfeit casino chips. The admiral, a career submarine officer, was referred to the US Naval Criminal Investigative Service after he became suspected in a case involving a casino in western Iowa. Special agent David Dales of the Iowa Division of Criminal Investigation told AP “a significant monetary amount” was involved. “We were able to detect this one pretty quickly and jump on it,” he added. It is not known whether Vice Adm Giardina’s alleged actions at the Horseshoe Casino in Council Bluffs had the potential to compromise national security or operations at Strategic Command. Navy Captain Pamela Kunze told Associated Press that he remains assigned to the command but is prohibited from performing nuclear-related duties or other activities requiring security clearance. Air Force General Robert Kehlerr, who heads Strategic Command, has recommended that he be reassigned, Capt Kunze said. Strategic Command, which oversees everything from America’s land-based nuclear missiles to space operations governing military satellites, is located at Offutt Air Force Base near Omaha, Nebraska. Vice Adm Giardina’s suspension follows several other incidents affecting the US military’s nuclear establishment. In May it was reported that 17 officers in charge of maintaining nuclear missiles were sidelined over safety violations at Minot Air Force base in North Dakota. In August a nuclear missile unit at Malstrom Air Force base in Montana failed a safety and security inspection, after which a senior security officer was relieved of duty.